The first secret to real, authentically textured fried rice is using day old cooked rice. This way the outside of the rice dries so it doesn't stick when fried. The rice should also be cold, frozen thawed rice is better than fresh. If you must use freshly made rice, be sure to cool it completely before using. The second secret is to use only short or medium grain rice, not long grain rice and definitely not converted (Uncle Ben's) rice. Sushi rice or Calrose work well. The only exception is, if you are feeding folks/children who have been accustomed to long grain in American kitchens. Preparing the rice: To have a permanent supply of cold rice, cook extra rice when you are making it anyway. Use the proportion of 1 1/2 cup raw rice to about 2 1/4 cups water and cook just until done, so that your future fried rice isn't too wet and sticky. Fluff it and spread it out to cool briefly, place meal-size portions into zippered plastic baggies, press out most of the air. Flatten and refrigerate up to three days or freeze. Remove from the freezer to the refrigerator the morning of day you wish to use it. By dinnertime, it will be thawed. If you microwave the rice briefly to thaw it, it and make sure it cools off before you start cooking. Peanut oil with a portion of sesame oil is the best. A few drops of hot chili oil heat up the dish. You need enough oil that the rice will all get a *slight* patina of oil once fully stirred, including the residual oil that's left in the meats that you've set aside. Three traditional choices are Japanese style- eggs cooked separately and diced; Canton style- eggs cooked separately and shredded; Egg binder- eggs slightly beaten and cooked among the rice. Some Chinese cooks use a combination of both shreds and binder eggs. There are many vegetable choices for fried rice; onions, peas, and diced carrots are very familiar. Onions or garlic, roots, wets, crunchies, greens. For each 4 cups of cooked rice, you want about 2 cups of vegetables. Vegetables should release very little water into the rice, so they must be cooked before the rice is added, if moist. Raw meats include chicken, small shrimps and lean pork. Shred into thin, fajita-type slices. Lightly sprinkle some cornstarch and a bit of soy over the slices, then mix thoroughly. You want the resultant mass to have a *really* thin coat of sticky cornstarch over all bits of meat. Cooked meats, such as diced ham, very thinly sliced dry Chinese sausage, Chinese barbecue or red-cooked pork are very traditional. Surimi "krab" bits or fishcakes (this white or pink fishballs in the refrigerator at the Chinese market) can also be sliced and added. Cooked leftover chicken or pork is also common. I cook with a lot of tofu, but not in my fried rice. It releases too much water unpredictably and messes with the texture. If you want to try it, cube marinated, already baked tofu very small, and try just a modest amount. On the other hand, thinly sliced cooked "Unchicken" wheat meat or gluten can be used just like raw pork or chicken with satisfactory results. You need traditional Chinese or Japanese light or dark soy sauce such as tamari or shoyu, which is more flavorful and less salty than American brands. Flavored sauces aren't so good. Too much soy sauce is a common error. I have seen Chinese cooks put a teaspoon of molasses into their soy sauce before they add it. Toasted sesame seeds or chopped peanuts dusted over the dish increase the protein value of the rice. A few tablespoons of chopped green onions are sometimes reserved from the vegetables to use as a garnish. You need a wok! You also need a gas burner, or two electric burners, one set on high and one on the low side of medium. Use a large flattish spatula that fits the bottom of the pan and has a heat resistant handle. Wood or plastic may scorch or melt over the high heat. You need to toss the stuff around some, so a light-weight utensil can be trouble. The basic motion is to insert the flipper on about a 45 degree angle down to the bottom, and twist outwards with a slight upward lift. Move bottom to top and middle to edge. Add water or soy sauce- any liquid- around the edge. It picks up the heat in the wok edges and boils on the way down, resulting in boiling liquid once it gets to the bottom. If you add too much water, you will get a gluey mass, no way I know to fix it. Too much oil just means you have an over-rich dish, tasty but rather heavy. Too little water, and the dish will be chewy, correct this by adding more water around the edge as above. If it is already out of the pan, cover and microwave it. Prep your meat or seiten/ wheat meat by thinly slicing (think bacon thickness, shred into thin, fajita-type slices). Lightly sprinkle some cornstarch and a bit of soy over the slices, then mix thoroughly. You want the resultant mass to have a *really* thin coat of sticky cornstarch over all bits of meat. Fix your veggies. If using snow peas, peel the strings off, by breaking off the tip, and pull down one edge, then grab the other end, and break it off and pull down the other edge. If using lettuce, spinach, or cilantro, chop it across the leaf. If using green/spring onions, wash them of dirt, pluck off any tired tips and leaves, peel the 1 tough outer layer, chop off the root ends, then chop the whole stalk into thin rings. Sort by length of cooking into root/ wet veggies, crunchy veggies and last minute veggies. Heat a wok or large skillet over medium-high heat. Toast the sesame seeds or chopped peanuts in the hot dry pan and set aside. Pour in oil and sesame oil, wait for a short time for the oil to get hot. If you are making separate egg sheets for cubes or shredds, make them now and remove. If you are using tofu (not recommended), make 1/4 inch dice, cook and remove. Replenish oil, heat and stir in onion. Sprinkle a little salt into the wok, to up the cooking temperature for the garlic and meat slightly. Fry onion until golden, then add garlic. When garlic is lightly browned, mix in raw meats. Stirfry until shrimp is pink, and meat just done. Remove the meats and set aside, draining the oil back into the pan. Wait for the oil to get *hot*. Don't worry if you get brown cornstarch bits coating the surface of the wok. They're tasty, and add a lot to the flavor. Lower heat to medium and add the root and wet veggies. If you belong to the "crisp-tender" school of cooking veggies, cook carrot slices (for instance) until they're *just* able to bend a bit at the edges. When using carrots in any sort of wok cooking, either dice very small , julienne, or cut the carrot at an angle, producing thin oval-shaped slices. This lets the carrot get a maximum of surface area on the wok, which speeds its cooking. Broccoli florets or cauliflower should crunch, but be warm throughout. Once you've got your root veggies (if any) cooked the way you want, toss in the "crunchies", celery, green pepper, and frozen peas, and stir-fry for about a minute or so. Fry until vegetables are crisp-tender. Hint: Anytime the tender vegetables are getting done too quickly, scoop them out and go on, you can always throw them back in later. Throw the rice in at this stage. You want the main bulk of the rice to be *very slightly* steamed, while the rice in contact with the wok should be being cooked at oil temperatures, not water temperatures. Stir it around, and splash soy (dark, if you're only looking for color and some flavor) in, until the color is right. Keep tossing and flipping the rice with the stirrer. When rice is almost right, mix thoroughly with vegetables. Stir fry until heated through, then add the soy sauce, salt (start with 1 teaspoon) and pepper. Mix well and stir fry for a few minutes but no more than 5 minutes or the rice will become mushy. If you have too little water (the soy itself *should* be almost enough, especially if you used light soy, rather than dark) then add a splash of it, around the edges of the wok. To make the egg binder, now push the rice-veggie mix up the sides of the wok. If you can't slide your cooked rice up the side and clear the bottom of the pan, your rice isn't quite right: too dry, too wet, or not yet cooked. Pour a tablespoon of oil into the wok. Pour the egg(s) with the slightly broken up yolks into the oil. Turn *down* the heat to quite low (move to the low burner if using electric). Wait until the whites are mostly cooked, and the yolks just start to firm. Only stir the egg a very little, if it really sticks. If it starts to burn, turn the heat down more. Once the yolks start to firm, start folding the whole mess back into the rice, with the same motion as above. This should result in small stringy bits of white and yolk mixed consistently through the rice. Toss in the meats, seiten or tofu again, the egg cubes or threads and the rice, and sprinkle on about 1/4 cup or so of good plain soy sauce. Mix it all together, making sure to spread out the soy sauce as much as possible. Make sure it's hot all the way through and ensure an even distribution of everything. The purpose of this final stage is to almost dry out the rice. You might be tempted to add some water or more soy during this stage, in order to help the mixing process. If it's still exuding a really slight steam, do *not* add water. If the rice has gone completely dry, add it slowly along the edges. The feel of the mix should be pretty light, and not gluey or oily. Wait until this is nearly achieved. Add the last minute veggies. If using fresh peas and/or snow peas, fold them into the mix now, wait a short while, then take off the heat, and serve. If using shallots/spring onions or bean sprouts, throw most of them in, mix them in, wait, take off the heat. Serve, and sprinkle the reserved green onion bits on top. If using chopped lettuce, cilantro or shredded spinach, turn off gas and serve. 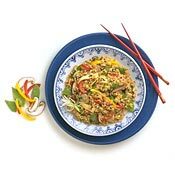 Place the chopped lettuce, cilantro or spinach on top of the fried rice, or even on the table next to the fried rice, to be served on top of individual bowls. Garnish with toasted nuts or sesame seeds.